A black man named Darius Larson (Samel Edwards) is surrounded by six cops before one of them kills him outside a bodega in New York City. 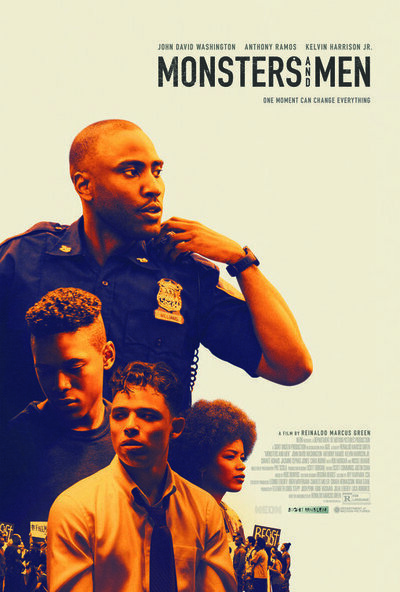 This inciting incident for Reinaldo Marcus Green’s debut is a direct mirroring of the real-life murders of Mike Brown, Laquan Macdonald, Botham Jean, Philando Castile, Eric Garner, Rekia Boyd, Stephon Clark and many others, the injustices that took them fueling this movie’s narrative and cinematic ambitions. Though sometimes thin in its goal on how to convey the experiences of those who are in between the headlines of the latest police injustice, “Monsters and Men” excels when it dives into the complications of race and authority, articulated vividly by three excellent lead performances. Casting is a vital element for this saga, and Green has three main faces that make a fascinating spectacle out of emotional processing; they are incredibly expressive with the film's reoccurring visual in which men are rendered speechless. This is especially the case with Washington’s Dennis, who puts a scared face to the film's best third and most complicated questions. He’s a cop that gets along with the neighborhood kids, who is conflicted about his role to protect and serve. At the same time, when talking to people who aren't co-workers, he outwardly tries to rationalize what happened to Darius Larson with his own fear when being a cop. As the script presents these issues as being more than black and white, Washington's passage is always compelling, especially as he tries to rationalize his work to his wife Michelle (Nicole Beharie) as if on autopilot (“This job is not a choice,” he tells her; “We always have a choice,” she retorts, in the movie's best line) or when facing an investigator who is looking into the dirty cop that killed Larson. "Monsters and Men" is clearly motivated by its pain and frustration, but it has a refreshing sensitivity that demonstrates a clear ability to start many conversations. As it seemingly wastes no shot in telling an expansive story in 95 minutes, “Monsters and Men” is always trying to be more than just a non-documentary recount of real-life injustices. But it loses this balancing act in its last third, which focuses on a young baseball prospect named Zyric (Kelvin Harrison Jr. of “It Comes at Night”) and the choice he makes about doing something when confronted first-hand by police racism, specifically in saying the name of Darius Larson at the top of his lungs. This part does feature a fascinating, restrained performance from Harrison, along with heartbreaking supporting work from Rob Morris as Zyric's father, who expresses a defeated attitude about the possibility of change. But even though its heart pulses with hope for the Black Lives Matter movement, the film starts to thin out and simplify itself, leading to a final moment more likely to preach to the choir than speak to anyone on either side of the debate. When its values and vision do sync up, “Monsters and Men” shows incredible promise for Green, especially as an economical filmmaker. He’s able to whittle down three full characters and then link their perspectives to make an intimate, timely epic out of approximately 30-minute passages. As he builds this world, and has subtle introductions to his characters (Zyric is just another kid playing basketball with Dennis and other cops in a low-key impactful scene), Green also offers stunning connecting moments, as when Manny stares into an interrogation room window and Dennis is then looking at him on the other side of the glass, or when Dennis casually drives by Zyric as he’s being accosted by police. We also see each of them watch Manny’s video, contemplating in the film's definitively quiet moments what they should do about it. Green especially orchestrates poignant symmetry with rhyming biographical details—we see what each of these men are like at home, in their closest relationships, and when interacting with figures who have authority over them. The outside of the bodega evolves too, from a peaceful gathering spot, to a crime scene, to a protest space, to a prayer vigil. There is plenty in this movie that is said about not being white in the face of police, just as much as there is about choosing humanity.